Many homeowners use carports to protect their vehicles from the elements like sun, rain and snow. But what if you could use your carport for a dual purpose? By adding a solar powered system to your carport, you can further utilize this structure as a means of gathering energy. Because solar energy is still more costly than other energy sources like coal, it is still not used as often here in the United States. Additionally, the process of making solar crystals is still slightly complex further limiting its use. Nonetheless, great strides are being made in the advancement of solar power. Therefore, in the future it will likely become a leading energy source. Energy gathered via solar systems produces zero emissions making it environmentally friendly. Additionally, it is free to use as it comes from the sun. And when the sun hits the roof or outer walls of the structure, it then converts into heat. Exceptions to this is when the building is made of a penetrable material that takes the sun’s heat and then makes it into an electrical current. Solar power begins with a simple cell. This cell contains crystals that absorb light that later produces these electrical currents. The electrical currents evolve when electrons within the atoms begin to move around as a result of sun light. Similar to photosynthesis, solar cells create a current that is transferable for future use as an energy source for an appliance or battery. In the past, solar technology used silicon crystals to produce energy. Nonetheless, these crystals were expensive to produce because of size. They were however extremely effective in converting light into electricity. Today’s crystals used in carport solar systems are actually thinner, more flexible and cheaper to produce. But despite their affordability, they are not quite as efficient as the older, traditional silicon crystals used in solar technology. 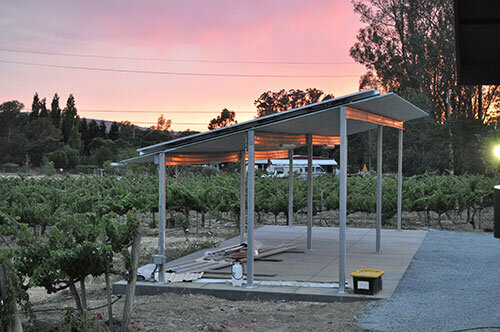 Despite these drawbacks, solar powered carport systems are still cost effective. Along with getting quality covered parking, you can also produce energy from this same structure. And because frame systems and solar panels receive the same depreciation benefits, solar panels offer a great advantage. Panels used to make our solar powered covered parking systems are more efficient than other brands. When the cells of these panels come in contact with light, they are able to convert a little over 20% of it into reusable energy; as opposed to more cheaply produced cells that convert a maximum of 18% of light it intakes. Although even higher quality solar cells known as silicon solar cells (like the ones used with satellites) can convert as much as 50% of light into electrical power, we have opted to use a middle of the road product to save on costs. Unfortunately, your solar panels may not always provide enough energy for your household. Consequently, it may be necessary to supplement with other energy sources such as those provided by a power company. One strong option is a photovoltaic system which supports your solar carport system by providing energy when it cannot. This includes days when there is limited sun. In this case, the grid-tiered solar system works in conjunction with a standard electricity line. And when there is no more energy in the solar system, the electricity will kick in. Gratefully, the power company can only charge you for the amount of power you use, and should you produce more energy and the grid have a surplus, you may actually receive a credit on your bill. Location is vitally important to your producing solar energy. Consequently, when installing your carport, be sure to choose a space where there is lots of sun. Additionally, the panels will be more efficient when facing south, towards the sun. Before placing your order, we will need to know your design plans along with the weight and dimensions of each PV panel. We must also know how you plan to layout the carport including the angle of the panels in order to get the most sun exposure.